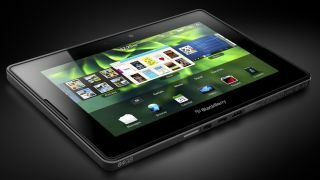 The spacious 64GB edition of the BlackBerry Playbook has taken a karate chop to the price tag, now available for as little as £129. You'll have to head over to Dixons or PC World to nab the offer, where you can get the 64GB version for less than the 32GB. It represents a total saving of £430 on the 64GB Playbook's launch price of £559. The 7-inch tablet has enjoyed mixed fortunes since it was unveiled in late 2010, with price cuts coming hard and heavy despite the news that the tablet will be upgraded to BlackBerry 10 when it lands early next year. We may not have fallen completely in love with the tablet in our BlackBerry PlayBook review, but there's plenty to like about the slate, including its nippy performance. And with a price tag that undercuts the Google Nexus 7 and availability that out-does the yet-to-reach-the-UK Kindle Fire, the £129 deal should have a few tablet fans reaching for their wallets.